The growing need for more housing in the twentieth century was met in three chief ways: by the conversion of large old houses into flats; by infilling the extensive garden grounds of older houses; and by completely new development on formerly agricultural land as the price for building plots rose dramatically. From about 1900 until after the First World War there were few new houses and no new roads built in Datchet. Development really began in the 1930s and although it was slowed down by the Second World War it had gathered pace by the 1960s. Then in 1969 Bucks County Council’s ‘Datchet Plan’ identified a number of areas where it was recommended that development should provide housing for a rising population. Within the next few decades new roads were laid out and housing was built on almost all of these sites. Two builder-developers in particular contributed a great deal to the modern village. Charles Masters was an established builder, working for the Midland Bank among many other contracts, and lived in Horton until about 1930 when he and his son Nelson began several decades of work in Datchet. 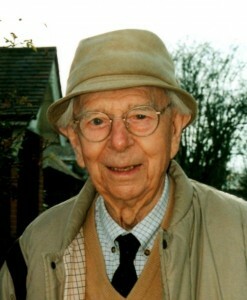 In a similar progression, George Scott arrived in Datchet in the 1930s after developing housing estates in Staines and Laleham. Both Scott and Masters carried out conversions within existing houses and their grounds, and also built on completely new sites. A group of houses opposite Lawn Close on the north side of London Road were built in the early 1930s although the row of separate plots had been sold in 1911 by the Buccleuch family. Probably built by individual builders they are in a variety of styles. They remain isolated, backing onto land bordering the M4. Leigh Park seems to have been the first small housing estate to have taken the place of one over-sized grand dwelling, Leigh House and its grounds. As well as the cul-de-sac, this 1930 development by Charles Masters included houses along the London Road and Horton Road boundaries of the original estate. Montrose Avenue and Fairfield Avenue were created by Cranebridge Estates of Twickenham. The company bought a very large area of agricultural land from the Barker family in 1930 which was bounded by the London and Ditton roads and had previously belonged to John Kinross of Riding Court Farm. Apart from the two new avenues, the estate extended along the upper part of London Road, which was then named Crane Way. Development here ceased at the outbreak of war in 1939, and afterwards the roads which had been opened up but left incomplete were used to build council housing, extending into Montrose Close and Montrose Way. Cranebridge had previously built a very big estate of similar houses at Whitton in Twickenham and named a Montrose and a Fairfield Avenue there. Lawn Close is another example of how the grounds of a great house were developed, in this case those of The Lawn where the original house does still exist. FL Sabatini, its owner from about 1930, had the building converted into apartments with George Scott’s help, and then in 1935 sold most of its grounds to Scott who created Lawn Close. (At the end of this road, beyond where it turns to the east, the Lawn’s old boundary wall still runs through the modern properties.) Scott lived in one of these modest houses himself, while his parents and members of the family occupied others. Link Road, creating access from Lawn Close to Horton Road, was completed in 1956 by the developer McManus Childs, and the street’s name was given by Parish Council. Linchfield Road was built in the late 1950s, on land which once belonged to the Lascelles family, Earls of Harewood. The Linchfield Brook which ran across the site from the recreation ground had to be culverted to create the new road and its extension into the older arm of Lawn Close. ‘Linch Field’ was the name of the medieval open field in this area, so it is a genuinely old name. At the start of Slough Road, beyond the shops which are opposite the garage, a row of substantial houses lie well back with long front gardens. These were built in the late 1930s by Nelson Masters. He and his family lived in the end house where his daughter Diana was born; she became known to many people as Diana Yule. Ruscombe Gardens occupies the site of a big Victorian house called Holmwood. Nelson Masters bought it hoping to redevelop there, but during the war the house was requisitioned as an operations base. Later, it was kept in reserve for the western arm of the planned Datchet by-pass to reach Windsor Road, as recommended in the 1969 Plan. Eventually, after the stop-go financial problems of the 1970s the whole plot was released for housing development. There appears to be no local explanation for its name. Gables Close was similarly developed on the site of an old house called The Gables. From map evidence, Castle Avenue was built after 1932 and before 1938, while Eton Close and Agars Place are much later, not appearing on maps until the mid-1980s. The houses in Agar’s Place had to be built to exacting floodplain requirements and raised above ground level. In 1953 George Scott bought several old properties on South Green (east of the Manor House) from the Cleversley family, including workshops, builders’ yards, and the near-derelict Old Manor House. In their place Scott built the Post Office and the shop opposite it (currently a hairdresser’s), also managing to fit in a meeting hall as a gift for the Women’s Institute because he was so impressed by the enthusiasm of the WI members, including his wife. He restored Old Manor House for his daughter, Mavis Louise Harris who now lives in Sussex, and when he built the Grosvenor Stores she was its first tenant, managing the shop on modern self-service lines. On his Laleham estate Scott had built a similar shop also called Grosvenor Stores. Several houses in the grounds of the Old Priory on North Green were built or altered by Nelson Masters, although he did not live there himself. However, he did add a small shop to the frontage of the main Priory house, originally Edwards the grocer’s and more recently an art gallery, now an estate agent’s. The maisonettes in Hall Court were built on the site of a late Victorian house called The Hall which was demolished in around 1970, according to the evidence of Ordnance Survey maps. Manor House Lane, behind the station, was recommended for housing and business development in the 1969 Datchet Plan. It included flats over shops and parking, accessed from the High Street, but the industrial units built further down the lane were not envisaged in 1969. The Paddock, Saffron Close and Elm Croft were built during the late 1960s and early 1970s as developers sought out remaining small plots of land behind the 19th century Montagu Road houses and created short cul-de-sacs to access clusters of new houses. Saffron Close was so called because the Parish Council promoted the use of local names, and Saffron Close was a very old field name — but the original was nowhere near the new road, but actually the site of St Mary’s school. The Drive cul-de-sac was created by Nelson Masters running towards the rear of his own Riverbank property on Southlea Road. He also built several houses at this point in Montagu Road, extending the original Victorian development further east. Beaulieu Close was eventually built in the 1970s although Charles and Nelson Masters had owned the site since 1933. This land was adjacent to the great 1890s house Riverbank, which the Masters had bought and converted into apartments. The Second World War prevented development and then after the war it was further delayed by the site’s designation as Metropolitan Green Belt. It was the 1969 Datchet Plan which changed the situation, as the Masters’ land was one of the major sites recommended for new housing. Laing was one of the big building companies alerted by the Plan, and the land was sold to the firm by Nelson Masters in about 1970, when planning permission was finally granted. The name Beaulieu Close was an appropriate partner for Montagu Road, both referring to the Lord of the Manor’s titles. The passageway from Beaulieu Close through to Montagu Road and over the railway footbridge to the recreation ground was identified as an important footpath route in the Datchet Plan before any building work was begun. Houses on the east side of Southlea Road, just beyond the Masters’ house Riverbank, were also built on land sold by Charles Masters in the 1930s. On the opposite side of Southlea Road Nelson Masters was involved in building new houses within the riverside grounds of Woolacombe and Sandlea House. Montagu Road’s eastern extension, Lombardy Park, also owes its existence to the Datchet Plan. The large site was included in the same recommended area as Beaulieu Close, but its development did not take place until 1982. There had long been an industrial works here, where Howards’ made Bailey bridges during the war, served by their own railway siding, but the whole site was eventually acquired by the builders Charles Church. The name of the new estate refers to the Lombardy poplars which grew along the estate’s southern border with the fields of Southlea farm. Holmlea Road, Holmlea Walk and Marshfield were also developed following the Datchet Plan, increasing the size of the small local authority estate which had been built to the west of Holmlea Road during the 1960s, and building to a similar density. ‘Marsh Field’ was the medieval open field south of Horton Road. 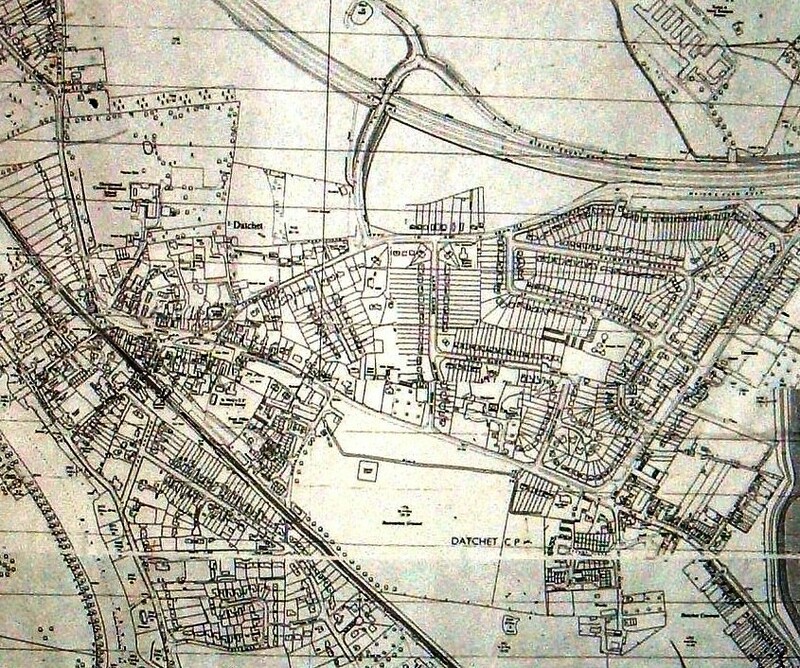 The site of Cobb Close, east of Holmlea Road, was also identified for housing but its development was delayed due to the presence of landfill in an area which had long been used for small-scale gravel extraction. 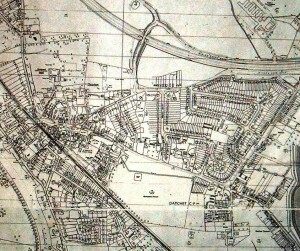 Before 1900 there were small terraced cottages at the foot of Ditton Road and New Road, and many more in Penn Road, but it was proposed in 1969 that the area should be redeveloped at a higher density. A few of the old houses still remain but by the mid-1980s new houses and blocks of flats lined both Penn and New Road. 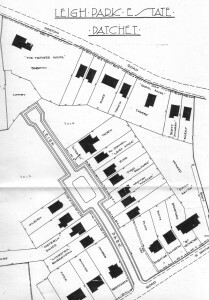 After the land behind the Allotment Cottages further up Ditton Road was sold in the 1980s, the development of Penn Road snaked further north until it reached the boundary of the cemetery, much further than had been envisaged in the Datchet Plan.